The little black fish is tired of swimming in circles all day, so she decides to leave and find out where the stream ends. 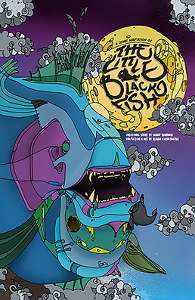 This comic is an adaptation of the children’s book “The Little Black Fish” by Samad Behrangi. There’s a note at the end discussing some of the changes from the original material, though none of them are that major. The main flow of the story is the same as the original text. I loved the art style in this. It’s very colourful with a lot of detailed patterns. The panel layouts are varied, which helps provide visual interest. The balance of text to art worked to make it clear what was going on. As to the story itself, its strengths and weaknesses are down to the source material. On the plus side, it’s a tale of how one person’s achievements can inspired others. The frame story is a fish telling her children and grandchildren (I liked the nod to biological accuracy, as there’s a huge number of them) about the black fish’s adventures. It’s a story about striving to achieve your dreams and ask questions, even if others are sure you’re wrong. It’s also interesting in a political context, as it touches on issues like people being shunned or killed to maintain the status quo, and attempts to suppress knowledge. As someone born to a working class family, feeling like life is swimming in pointless circles, and wanting to escape that, is something I can relate to. There are aspects I did not like as much, and would make me hesitant to read this to a younger child. Crying is treated harshly. To cry makes you a cry-baby and a disgrace. The old are criticised for whining about things. The black fish is called crazy, and calls others ignorant in response. Though being called crazy is portrayed as a bad thing, it is the black fish who is saying others must not complain about things and are ignorant for not agreeing with her. Those are all things people throw at others to shut them up (stop whining, stop crying, you’re just stupid), which rather goes against the central theme of the black fish wanting the freedom to speak her mind and achieve her dreams. It’s a selective freedom for her, and people who think like her. It’s also a rather simplified metaphor when it comes to the poor. A lot of people aren’t caught swimming in circles because they don’t believe there’s anything else, but because they can’t escape their circumstances. There isn’t an opening in the stream for them to swim down. Or if there is one, they’re not able to fit through it. This is implied with the lizard, as he offers support for the fish without going himself, but it’s not directly stated. 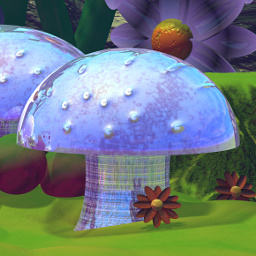 For an older child or adult, the story can be considered in the context of when and where the original was written. For a younger child, that’s going to be a bit over their heads. I think this would be a great book for any fans of the original, as well as people new to the story. The comic adaptation does add something extra. But it is very much a story where knowing the context is important, as some of the morals of the tale are a little uncomfortable in a modern context. I’m all for telling people to strive for their dreams and to be inspired by others, but not so much that it’s bad to complain or cry when something’s hurting you.